How is Sciatica usually treated? How has SciatiGon helped others? How do I use SciatiGon? Sciatica refers to pain experienced along the path of the sciatic nerve - the longest nerve in the body, which runs from the lower back through the pelvis and buttock area, right down to the back of the lower leg. Sciatica is a fairly common form of lower back and leg pain and is due to the sciatic nerve being irritated or compressed. The pain of sciatica varies from an infrequent discomfort to a continuous, excruciating and debilitating pain. Sciatica is usually experienced as pain that radiates from your lower back to your buttock and down the back of your leg. This pain may be mild or severe and is sometimes felt as a burning sensation or a sharp jolt. Sciatica may be sudden or insidious in onset and worsen over time. Some people who suffer from sciatic pain may also experience a numbness or weakness in the leg or foot, as well as a feeling of tingling or pins-and-needles in the toes. The most common cause of sciatica is pressure on the sciatic nerve from a herniated or slipped vertebral disc (“Pinched nerve”). Between each of the vertabrae in your spine lies a disc of cartilage to act as a cushioning shock-absorber and allow flexibility of the spine. With age and wear-and-tear, these discs may become brittle and compressed - allowing part of the disc to protrude from its normal position within the spinal column and press on the nerve root. This generally happens in people between the ages of 30 and 50. People in their 30’s and 40’s are most likely to develop sciatica, which is uncommon in younger people. Physically demanding occupations which require heavy lifting, driving long hours or twisting the back are all risk factors for developing sciatica. Most people with sciatica are prescribed pain-killers or anti-inflammatory medications to relieve the pain. These generally provide some relief, but have the potential to cause serious adverse side-effects. Medications are usually used in combination with physical therapy and stretching/strengthening exercises as well as hot and cold packs. In severe cases of sciatic pain that does not respond to the usual treatments, conventional health practitioners may advise injections of anti-inflammatory steroids into the affected area. These injections are not always very effective and can also cause serious side-effects. Because of the dangers, there is a limit on how many of these injections an individual can receive - not usually more than three per year. There are many things that can be done to support the health and functioning of the sciatic nerve. Maintaining the health and strength of the vertebra and surrounding tissues is very important. Practice good back health and be sure not to put strain on the lumbar region. Regular back exercises, as well as exercise like swimming and walking, can help to support the integrity of the spine. Be sure you maintain a healthy posture and consider taking up yoga or Pilates that can help to strengthen the central core of the body. Sleep on an orthopedic mattress to support your back at night and eat a healthy diet and take daily supplements known to benefit the health of bone, cartilage and nerves (zinc, magnesium, calcium, Vitamin C and manganese). Avoid cigarettes and excess alcohol! Natural remedies have also been used for thousands of years to support the skeletal and nervous system and modern research has confirmed their effectiveness through numerous published studies. SciatiGon is a 100% safe and effective natural remedy for relieving pain and addressing the various causes of sciatica. The combination of herbal and homeopathic ingredients selected for this remedy are well-known for their anti-inflammatory and pain relieving properties. They also work together in a synergistic manner to improve nerve and synaptic health and are therefore an effective preventative. Zanthoxylum clava herculis is also known as the Toothache Tree after its traditional use as a treatment for relief of toothache. Zanthoxylum is highly effective in stimulating the circulatory system and also has antispasmodic properties for the relief of cramps and the pain of muscular spasms. Matricaria recutita (German Chamomile) was regarded as one of the nine sacred herbs given to the world by ancient Anglo-Saxons. In modern times it is widely used as a gentle anti-inflammatory, anti-spasmodic and soothing herb. Matricaria acts as a general tonic for the nervous system and also relieves muscular pain in the lower back. Arctium lappa (Burdock) has been used for many centuries as a blood purifier and system cleanser. It also has antibiotic and antirheumatic properties and can help to treat swelling around joints. Burdock is also useful for treating and preventing calcification - a degenerative process which can contribute to the narrowing of the spinal canal. These properties make Burdock an excellent herb for relief of sciatica caused by inflammation or sclerosis in the spinal column. Burdock is used in naturopathic medicine to treat arthritis, lumbago, rheumatism and sciatica. Harpagophytum procumbens (Devil's Claw) This herb is indigenous to the Kalahari Desert and grows only in Africa. Because of its powerful anti-inflammatory properties, Devil's Claw is used world-wide for osteo-arthritis, fibrositis, rheumatism, small joint disease and lower backache. Scientific analysis shows that the most important active ingredients in Devil's Claw include monoterpine, harpagoside, glycoside, beta-sitosterol, procumbine and stigmasterol. It is also well known as a digestive tonic and is beneficial in the treatment of liver and gall bladder disorders. Rhus tox (30C) is a homeopathic remedy for back pain, arthritis and general aches and pains. Rhus tox is widely used for back pain and stiffness including trauma from lifting heavy loads and bruising or sprains. This remedy is also good for joint and muscle ailments, sciatic pain and neck stiffness. Colocynthis (30C) is used in homeopathic medicine for relief of colic, sharp pains and neuralgia. Nerve pain, including sciatica, abdominal cramps, rheumatism and dizziness are all effectively addressed by this ingredient. 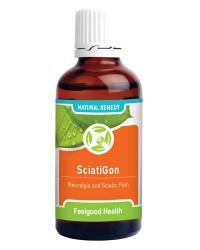 SciatiGon comes in a convenient tincture or drop form and is available in 50 ml bottles. Chronic: 10 - 15 drops in 1/4 cup water three times daily. Acute: 5 drops in 1/4 cup water every 30 minutes as needed. Do not exceed 10 acute doses in 12 hours. Caution: Please consult your medical practitioner should symptoms persist. Safety during pregnancy and nursing not yet established. Relief should be felt within minutes of taking SciatiGon. In severe cases the acute dosage may need to be repeated a few times before improvement is noted. Over a few weeks of using this natural remedy regularly, sciatic pain will be reduced and attacks will become less frequent. One 50 ml bottle will last approximately 30 days at chronic dosage. A 90-day supply (see the Buy 3 Get 1 FREE special) would be three bottles. How can I prevent sciatica and back pain in general? Taking good care of your back and spine can go a long way to protecting you from debilitating back pain and sciatica though some causes are not easily preventable. Regular exercise, especially exercise that strengthens your core muscles like Pilates and controlled strength-training of your abdomen and lower back, will provide spinal stability and improve posture. When sitting, maintain good posture by keeping your feet flat on the floor, your arms on the armrests or desk and your lower spine supported by a well-designed chair or the addition of a rolled-up towel or cushion in the small of your back. When lifting heavy objects bend down at your knees instead of your back and carry the object at waist level, held close to your body. Sleep on a firm mattress and avoid using more than one pillow. In the first 48 hours of the onset of sciatica, ice packs wrapped in a towel or cloth and applied to the affected area for 15-20 minutes at a time may help to reduce inflammation and relieve pain. This should be repeated about 4 times a day. Warmth applied to the painful areas will help to relieve pain after the initial inflammation has settled. Try a hot-water bottle or heating pad on a low setting. Gentle stretching exercises of the lower back will help to relieve compression of the nerve. Ask your physical therapist to give you exercises to do at home and avoid any jerking, bouncing or twisting movements. Any sudden and severe pain, numbness or loss of strength in your back or leg should lead you to consult your family doctor or physician. If you experience loss of bowel or bladder control at any time, seek medical assistance immediately.